The European Commission and the Education, Audiovisual and Culture Executive Agency (EACEA) organized an Information Day on the 30th of January 2018 in Brussels to inform potential candidates about the possibilities of Erasmus + Sport, EU funding mechanisms and EU sports policy. 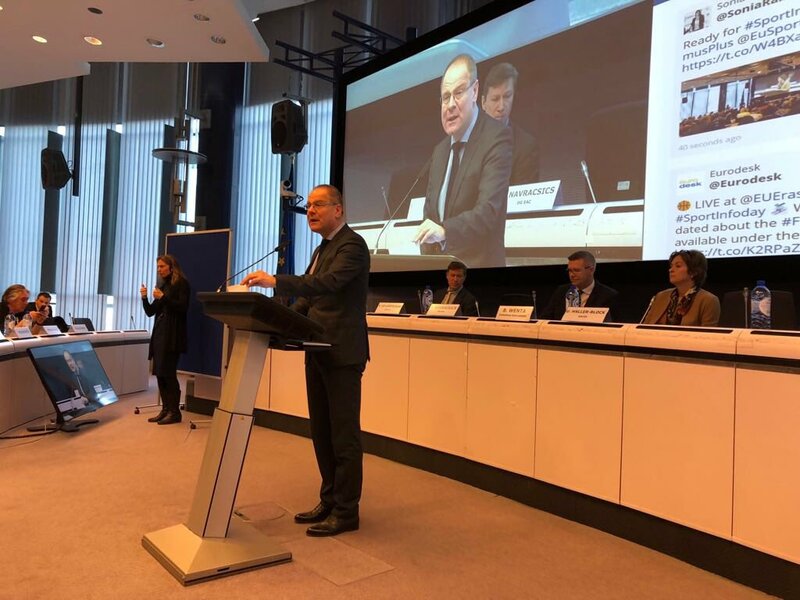 The event was opened by European Commissioner for Education, Culture, Youth and Sport, Tibor Navracić, who outlined the Europe's 2018 sports policy, which will also be a priority in the projects to be funded by the Commission. Experts who presented different presentations discussed policy with the participants, gave advice on preparing and submitting proposals, and highlighted the financial aspects of the program. The participants had the opportunity to meet current and future partners as well as to see examples of successful projects. The event, which brought together over 500 European experts, was attended by Joanna Dochevska, chairwoman of the Bulgarian sports development association, which held a number of meetings on current projects and plans to apply for future ones. On the January 31st 2018, a bilateral meeting was also held between the experts of the Executive Agency and the organizations that coordinated projects starting on January 1st, 2018. During the meeting guidelines were given for the proper coordination of the projects. Bulgarian sports development association started the Project "Good Governance in Sport" on the 1st of January 2018, which will perform different activities at local (in the seven partner countries), national and international level; will focus on developing, identifying, analyzing, disseminating and sharing good practice in good governance, and recommending some already observed practices that can be improved. The Erasmus + Sport program has a budget of € 46.5 million for 2018 and aims to increase physical activity in Europe, enforce the European Week of Sport campaign, apply the principles of good governance in the field of sport, develop the dual career of athletes, to take concrete steps in the fight against doping, to create opportunities for sustainable partnerships in the sphere of sport. In the full duration of the program, it administers a budget of € 265 million for the period 2014 - 2010, with € 124.5 million (including 2017) spent so far. An opportunity is now created whereby both EU citizens and the non-governmental sector can give their voice and opinion in a public consultation on the future of European policies in the fields of education, science, youth and sport. The survey is active until 8th of March 2018. The poll takes about 30 minutes and is available in the Bulgarian language. "In order to be stronger, the Union must have sufficient financial resources to continue to work on the implementation of its policies. In recent years, the Union has changed substantially as well as the challenges it faces. Our Union needs a budget to help us achieve our ambitions. The Multiannual Financial Framework for the post-2020 period should reflect this." (Commission Work Program for 2018).